Damn fine Bourbon and Favorite of the Elijah Barrel Proof releases so far! Their other bourbons include of course the Heaven Hill series, the Elijah Craig 12 ( IMHO one of the perennial best buys in a bourbon) and the Elijah Craig 18 Year Old. Some other lines of bourbons they produce are the Evan Williams line and the Evan Williams Single Barrel Vintage series they have released every year ( 2000 Vintage, 2002 Vintage, 2003 Vintage, 2004 Vintage ,and the New Make Series of unaged distillate (Rye and Corn), This one being the 127 Proof Version released in May of 2017, the other the Barrel Proof Versions at 124.2 released in January of 2017, the other. For an explanation of Barrel Proof, please look in our classification section. 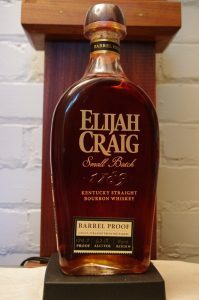 The Barrel Proof series is the latest and follows on from other previous premium releases of a 20 Year Old and of the 21 Year Old Version, 23 Year Old Elijah Craig versions. 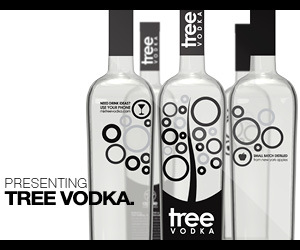 This barrel proof series has between 3 and 4 releases a year at different proofs due to the variations of the batches. The Elijah Craig Barrel Proof series will also vary in color and taste within a certain (company and brand profile) degree so each one will be different up to that point. Barrels falling outside that profile will probably end up in larger blends, or in extreme cases, sold off to be used somewhere else under a different name. Appearance: Clear copper/patinated bronze colored showing a nice aging profile. On swirling, it leaves a medium coating on the glass and rapidly forms marginally thicker legs than the 124.2 and slower to form and flow back down. Definitely more viscosity here. First Impression: Caramel, vanilla, saddle soap, Vietnamese cinnamon, leather, Yenedjie tobacco, oak and alcohol blending nicely, less Spanish cedar than the 124.2 version and heavier on the caramel, and darlheavy flavor notes with a dark cherry and char finish that lingers nicely. Taste: Pretty much matches the nose/bouquet, with a preponderance of caramel and vanilla, with the char, oak and leather dailed up a notch. If you want the full effect and taste add some water to open it up a bit (one of the things I like about barrel proof spirits is you can proof it or mix it to your taste/requirements- too many whiskies are already too watered down before you even get them these days – especially if you are making cocktails with them ! Drinks: Speaking of which…. Recommend for mixing. Makes a nice hearty bourbon component in most of our favorite classic bourbon cocktails. This one has a nicely weighted feel and taste. Add some more ice adjust the portions a little bit, and or stir it a bit longer to taste.. You can add ice and water a lot easier than remove them. Enjoy ! Bottle: Horseshoe shaped flask of clear glass reminiscent of the older style bottle which was thicker and shorter more of a horseshoe type. This one I would almost call tombstone. This Elijah Craig bottle has a more sloped neck, slightly elongated so you can get at least two fingers around it, with a thin old gold on black neck ribbon that says “BARREL PROOF”. The front label is silkscreened on with 1789 embossed into the glass with a further small paper label that states “BARREL PROOF”, ” UNCUT STRAIGHT FOM THE BARREL” and the proof, alcohol by volume, and batch number. Side label is paper, cream and black with alternating print depending on background – cream on black or black on cream, with age statement ( 12 Years Old) and “NON- CHILLFILTERED”. Cap is standard Elijah Craig wood topped stopper with Elijah Craig signature carved into the top with a natural cork and clear plastic neck capsule. Slightly weighted decanter type bottom and standard size neck opening that should fit a speed pour. As a sidebar, the older version had a much wider neck – which was great for pear in the bottle experiments afterwards – sad to see them go! Other: We are going to go out on a limb here and suggest the reason we may be seeing barrel proof is for two reasons; 1. The demand/fascination/call for Barrel Proof editions of a whiskey, 2. The shortage of stocks of vintage whiskey especially 18 years and older. Final Thoughts: One of the better barrel proof expressions we have had in a while and a definite favorite ! 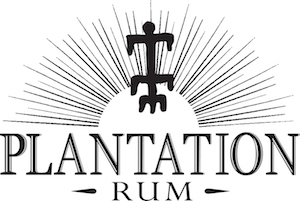 The main distillery website, it also has their plethora of other brands they either make of import also. A fairly informative site by industry standards, it does not have as much depth of information on their American Whiskies as the site below does – but offers a great overview of everything they are involved in. Fast loading and easy to navigate. This one of the most comprehensive bourbon ( or any other spirit for that matter) website I have come across – and that is saying a lot! Extensive information and good pictures of how bourbon is made, the distillery, the bourbon heritage with reviews and ratings by different people and organizations of the different vintage years. Also the most extensive store of bourbon related gear and accessories in the industry. The more specific webpage for their higher end America Whiskey portfolio with a good amount of information, photos and recipes. If you become a member of the Bardstown Whiskey Society ( recommended) you unlock a lot more information and benefits from joining.